Lisa Strasman was one of the first competitive female ice hockey players in Illinois, and went on to captain the team at Yale University. After graduation she traveled to Switzerland to play professional hockey. 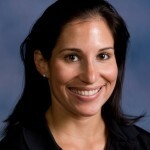 Strasman began her true professional career in technology sales before joining NCSA as a Recruiting Coach in 2004. She was instrumental in creating the platform for servicing thousands of student-athletes, parents and coaches which has led to over 60,000 student-athletes receiving college roster spots. As President of NCSA Strasman runs all day to day operations, oversees the Chicago headquarters, and leads NCSA’s executive team. She resides in Chicago with her husband and two children. We're highlighting local Chicago companies, entrepreneurs and individuals improving the game from the inside out - including new technologies, wearables, data analytics and more.